I recently decided to try a three week food cleanse at the recommendation of Dr. Maggie Ney from the acclaimed Akasha Center for Integrative Medicine located in Santa Monica, CA. I am not one of those girls who tries the latest fad diet. In fact, I never deprive myself of carbs, sugar, gluten, caffeine or alcohol. I try to eat and drink all in moderation--well, maybe with the exception of bread, pasta and chocolate...LOL. I was excited to try the cleanse as it promised to increase my energy levels, improve mental clarity, enhance digestion, diminish food allergies and help with weight management. The cleanse in a nutshell: One fruit smoothie a day, organic fruits, veggies, fish and meat! Sounds easy but wait--no gluten, sugar, alcohol or caffeine. Ugh! Read on for details and some yummy recipes! In Mexico three weeks post cleanse Lost my muffin top…yes, I had one before starting the cleanse. The cleanse was difficult the first week. For most, giving up caffeine and alcohol is rough. For me, it was removing the bread and pasta from my diet. The best way to tackle the cleanse is to come up with creative dishes that you enjoy so you don't feel deprived. This does take some time and planning. One of my fave concocted "cleanse salads" that mixes sweet with savory. 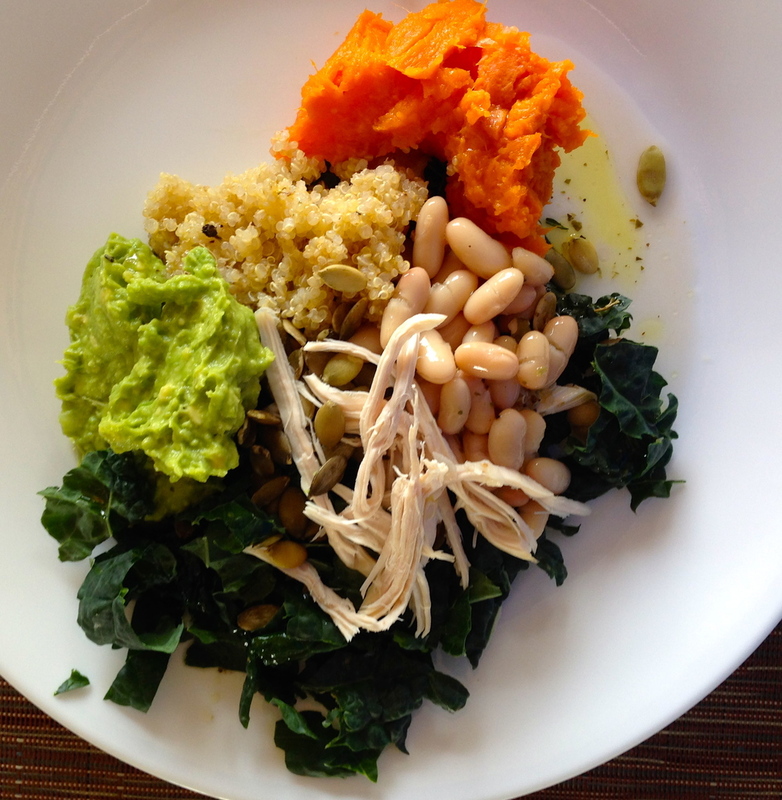 Shredded dinosaur kale, Tuscan beans, mashed avocado, quinoa, mashed sweet potato, pumpkin seeds. Dressing: olive oil, lemon, salt and pepper. Splash of red wine vinegar. First, I met with Dr. Ney who reviewed the list of "approved" and "unapproved" foods with me. This list scared me at first. I immediately ran over to Whole Foods and bought most of the eatables. I have never tried millet or amaranth before and was surprised at how delicious they were as cereals. I worried about eating dinner out but managed to find things on most menus that worked. I soon realized that it was pretty easy to modify restaurant menus here because everyone in California is on some sort of food cleanse. Drink one smoothie a day as a meal…can be for breakfast or lunch. Fresh berries from the Brentwood Farmer's Market. SWEET! The Akasha Center recommends adding supplements to your smoothie. These include powdered protein, greens and fiber. Also, take a probiotic daily to help with digestion. All supplements are available on their website at www.akashacenter.com. Culturelle also makes a good probiotic. Blue Diamond delicious almond milk. Salmon lunch at the Beverly Hilton. Crudite from True Food Kitchen, Santa Monica. Buddah at the Akasha Center for Integrative Medicine. The cleanse really taught me how to eat clean! I felt amazing after three weeks of detoxing and knew that I could incorporate some of these new eating habits into my current lifestyle. Another perk was that I lost six pounds and noticed an increase in my energy levels. I can't say that I cut out all bread and pasta now, but I have reduced it's consumption and gained an awareness of how different types of foods affect my body. Akasha Center for Integrative Medicine, LLC. Cut spaghetti squash in half lengthwise and lay flat side down in a large baking pan with ½ inch water. Bake in oven for 45-55 minutes or until a fork can poke through the rind. 1-4 cloves of garlic (depending on how much you like garlic)Blend well. Remove squash from oven and carefully fork out “spaghetti”. Top with pesto. Oven toasting: Preheat oven to 350 F. Spread grains on a cookie sheet and toast in oven until they give off a nutty aroma (12-15 minutes). Skillet toasting: Place washed grains in a large skillet on burner and toast on medium heat, stirring constantly, until grains give off a nutty aroma (5 - 8 minutes). Let toasted grains cool and store in sealed container. You can toast a big batch of several different grains at one time and store them in separate jars. For the best nutrition, grind grains just prior to using in a small electric grinder or food processor. Once a grain is ground it begins to lose nutritional value within 24 to 48 hours. Store the whole toasted grains in labeled, sealed containers and grind the amount you need before cooking. To cook ground grains into cereal use 1/3-cup ground cereal and 1 cup water per person. Combine cereal and water in a pot; bring to a boil. Reduce heat to low and simmer, covered, for 10-12 minutes. Top plain cooked cereal with a almond milk and fruit.